The article below describes how to teach yourself to Calm the discursive thought in your mind and to live, truly Live, your life as the Naturally Blissful Being you really are. It is not magic nor is it complicated in any way but it does take a continuous effort to refocus your mind back onto your body where it should naturally Be. The mind and the body are not two separate things but have become "separated" by the chaotic habit of discursive thought or thinking that we humans fell into long ago. We got "Lost" thinking about Reality instead of just Living IT! I will save the when and the how this happened for another time because it gets into the very complex topic of the evolution of the brain. Also, it is not necessary to understand how we got "Lost" in order to find our Way back. Enjoy this very important article, put the information to use, and please check out the other articles at the bottom of this post. They contain more information that can help you get back to your True Nature. There is a technique that has been around for thousands of years and has been used to point countless sentient beings toward their natural state. Simply following the breath. There are many variations of this but we want to keep it very simple. Our true nature, our natural state is very simple. But because it is so simple we completely miss it. It is always there yet it goes completely unnoticed. It's the foundation for all appearances. It exists before thought and interpretation arises in mind. It is before language. It is beyond conceptual thought. It is our foundation. Our basic, eternally free, pristine, primordial, free from suffering state of being. It is consciousness without content. Techniques are used as aids to help calm and center the mind. When thoughts have subsided, and there is more empty space between thoughts. When the chain of unending thoughts has been broken, it is easier for insight or wisdom to arise. You see, everything that we believe we know, all of our opinions, judgments and interpretations are simply thoughts. They have no existence apart from the thinking mind. Reality functions perfectly without them. What we think about existence has nothing to do with existence. They are only thoughts superimposed onto reality. Existence cannot be known through thought. We can speculate about the observed using thought and language but thought can never penetrate reality. It will only be speculation based on observation. Thought can only be on the surface. We are not separate from existence. We do not live life. We are life itself. We do not live within the universe, we are the universe. 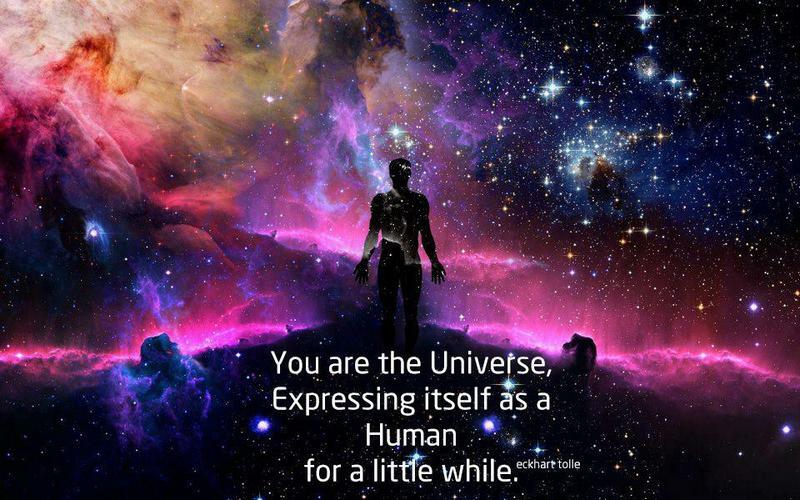 We are existence itself. All that is seen and unseen is nothing separate from who we are. The thinking, dualistic mind separates all things experienced into parts and pieces. When abiding in the natural state, there is no separation. There is no this or that. Everything simply exists as it is. All of these things aforementioned are simply thoughts about reality. The mind has added these things to reality from its previous conditioning. The mind has been conditioned by the society, the family, the friends. The mind is conditioned to express what it experiences with words, labels and gives everything attributes. Reality is wordless, thoughtless and without attribute. Although who we really are is inexpressible, we must use words in order to communicate that there is something which is inherent to us all that is naturally free and communicate methods which point to that. Whether it's following the breath, mindfulness practices, pranayama, or many of the countless meditative practices that exists today. All genuine practices are simply pointers to your natural state. When you breathe, notice where the sensation of the breath is the most dominate. Maybe the sensation of the breath is dominate at the tip of the nose. Maybe the sensation of the chest moving up and down is the most dominate. Maybe the sensation of the abdomen moving in and out from the breathing process is most dominate. Whatever is most dominate within the attention, use that as your breath spot. When one moves the attention to the breath, move it to that spot. In the beginning it may be very difficult to keep your attention on the sensation of your breath. The mind is not used to being held hostage at one point. It hops about from thought to thought like a monkey hopping from tree to tree. In some traditions the mind is referred to as "the monkey mind". Because it never stops moving from thought to thought like the energetic monkey hopping from place to place. It will take a lot of practice to tame this monkey mind. And the practice must be continuous. Whenever you remember, bring your attention to the breath spot for as long as possible. If the attention wanders away from the breath that's fine. If it ‎ happens 1000 times that's normal. You have to tame the mind. Not forcefully. Gently. When an emotion (emotions are rooted in thought) or thought pops up, quickly ‎ bring the attention to the breath spot. Don't follow the thought or finish it. Just let go by moving the attention to the place where the breath sensation is most dominate. Practice this way when ever you remember. ‎You will forget many times. You may even forget for an entire day. Don't despair. That's normal for an untamed mind. You see, what will eventually happen is following the breath will become habitual. Your attention, from continuous practice, will naturally go to the breath as its natural resting place. Now, your attention endlessly follows every thought in the mind. Thoughts in the average worldly person are like links in a chain that is endless. The mind babbles away about everything it experiences. With breath practice, the attention is being habituated to the breath so that its natural resting place will be the body and not your thoughts. If your attention is on the body and not on your thoughts, what is there to trouble you? ‎ Your thoughts are at the root of all your troubles. Just keep practicing at all times when you remember. It will not be easy.‎ Eventually through continuous practice you will not even need the support of the breath. Your breath is just an aid to help bring the attention away from thoughts and also the mind will become naturally one-pointed as a result. This creates a situation which allows tranquility to gain dominance over thoughts and it becomes natural within consciousness. When the mind is tranquil, there will be a clarity that you have never before known. When you experience your life without thoughts, you will have experience and will be able to compare it to your life with thoughts. You can purposely observe life around you without thoughts then compare it to observations with thought. You will see from direct experience how thought defile all that is experienced or perceived ( because it adds to the experience, instead of allowing the experience to be as it naturally is). You will know without doubt that thought is the root of all misery. Abidance in the natural state is bliss beyond imagining. In this case, the word "bliss" does not refer to some over stimulation of the physical body. Although in the absence of thought (concentrated mind) there are sometimes physical sensations in the body that are beyond any physical sensation normally felt. There is a feeling of rapture. All the cells in the body are exploding with energy. But in this case "bliss" is the absence of all that you are not (thoughts). When all that you are not (thoughts) has been seen through, suffering will be no more. Just keep practicing. Don't give up. It will be very difficult. Maybe frustrating. It happens to everyone like this. At times it may even seem as though it's hopeless. I think it's like that for all seekers. At some point, all seekers have felt this way. Unless you're a rare one like Ramana Maharshi who spontaneously came into his natural state without effort, there will be hardships. When an emotion arises, switch the attention to the breath spot. When a thought arises switch the attention away from the thought to the breath. Don't engage in the thought. When you engage in the thought, it proliferates. Before you even become aware, you have completely wandered off into fantasy land from that thought. If this happens, don't beat yourself up about it. That only creates more thought. Just try it again, and again, and again. Any judgment on your part will just create more thoughts. Don't judge! Simply practice wholeheartedly. That's all that is required. And don't think of it as a chore. The mind must come to love and adore the breath. The more the mind adores the breath the easier it will be. Also do not alter the breath process. Let the breath be natural. Any intentional alteration of the breath is subtle thinking. But even if there is some involuntary controlling, that's not unusual. Just do your best and allow the breath to be natural. When you watch the breath, don't mentally verbalize the process. Just try to remain internally silent as best you can. This is why we are here - to Awaken to who/what we Really are. Jesus of Nazareth experienced this, overcame this world, and tried to teach his disciples "The Way", as he called it. There is absolutely no difference whatsoever between his teachings, those of Siddhartha Gautama (Buddha), Lao-tse (Tao Te Ching), and every other Teacher like him of the One and Only Ineffable Truth since the beginning of time. The Truth is the same everywhere in the world but the terminology, oral and written, is necessarily different because the perspectives of this Singular Truth are based upon their respective cultures and the life-long experiences of every individual. Nothing more! "Sudden Illumination means deliverance while still in this life. How shall I make you understand that? You may be compared to lion cubs, which are genuine lions from the time of their birth; for, with those who undertake to become suddenly illumined, it is just like that. The moment they practise it, they enter the Buddha-stage, just as the shoots put forth by bamboos in spring will have grown to resemble the parent plants without the least difference remaining even before spring has departed." Once a man who practised Chan asked Hui Hai: “It is said that mind is identical with the Buddha, but which of these is really the Buddha?” Hui Hai: “What do you suppose is not the Buddha? 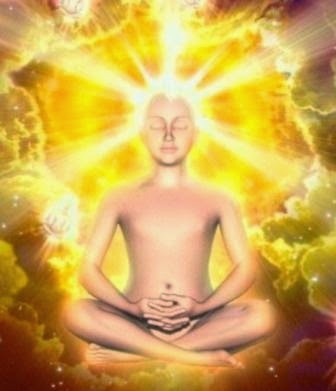 Point it out to me!” As there was no answer, the Master added: “If you comprehend (the mind), the Buddha is omnipresent to you; but if you do not awaken to it, you will remain astray and distant from him for ever." * Hui Hai was a student of Ma Tsu (709–788; Japanese, Baso) and from the same line as Huai-hai Pai Chang, Huang Po, and Rinzai (Lin-chi). **John Blofeld (1913-1987), a noted Buddhist writer and translator, was one of the few Englishmen to experience life in China prior to the Communist revolution. His love of that country and of Buddhism enabled him to translate the texts with feeling and insight. Here is a beautiful Creation Story from the Sioux Nation that expounds the same Wisdom as Jesus, Buddha, Lao-tse, Chuang-tse, and All Enlightened Beings since the beginning of time. I particularly like this story because I have used the same terminology for a long time so people here in the West can relate to "Within". Enjoy! In the center of our own Being lies one of the greatest esoteric mysteries — a Holy Sanctuary where we can take refuge from the trials and tribulations of daily life. That Sanctuary has been referred to throughout the ages as the mythical Garden of Eden—a place where we can go to seek renewal, healing, and inspiration anytime we desire. 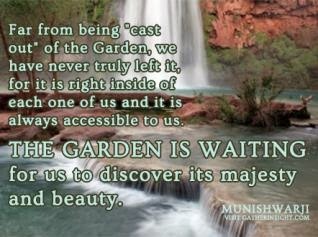 Far from being "cast out" of the Garden, we have never truly left it, for it is right inside of each one of us and it is always accessible to us. The Garden is waiting for us to discover its majesty and beauty. There is a Sioux Creation Story which speaks of this Great Esoteric Secret. "Give it to me," said the eagle. "I will carry it high into the sky." "No," said the Creator. "They will go there one day and find it." "Give it to me," said the buffalo. "I will burry it deep beneath the Great Plains." "No," said the Creator. "One day, they will dig into the Earth and find it." "Give it to me," said the Dolphin. "I will carry it far under the sea." "No," said the Creator. "They will find it even there." And the Great Creator said, "It is done." We begin to cultivate awareness of our Inner Sanctuary and the fact that God dwells within by becoming still. In Genesis, the Old Testament tells us that God "placed at the east of the garden of Eden Cherubim, and a flaming sword which turned every way, to guard the way of the tree of life." For those of you who are familiar with the Teachings of the Eastern Occult Doctrine or the Tarot, you will know that swords mystically refer to the mind, and a flaming sword refers to a I'mmind burning with activity. Only through quieting the mind can we move past the flaming sword and return to Paradise. We do so through deep meditation. By regularly quieting the mind and seeking refuge in our Heart, we attune our senses to the stillness within, and that stillness begins to permeate our life. Here's a Guided Visualization for the purpose of Returning to Eden. 1. Find A Still Quiet Place where you will be undisturbed for 20 minutes. In the Eastern Occult Teachings, the Number "2" refers to Major Forces at work (with Capital "M" and Capital "F"), referring to God teaching in the Dark and in Silence; the Number "0" refers to the Wise Fool, meaning one who displays Enlightened Action. 2. Focus on Your Breath, Watching Every Inhalation and Exhalation. Inhale and exhale through the nose. Allow your breath to be slow, steady deep and uniform. 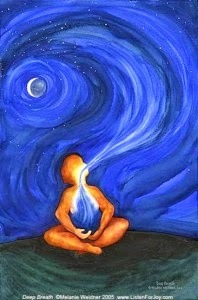 Allow your inhale and exhale to be of equal length. 3. Experience the Mind Become Still, Like a Clear Mountain Lake. If thoughts come into the mind, simply let them float by like clouds floating through a sunny blue sky. 4. As you watch your breath, notice that there is a space in between the inhalation and exhalation wherein there is stillness in the midst of movement — in that space, become very aware of your Human Heart. As you continue to breathe, experience the space of stillness open up more and more until it beings to permeate your meditative experience. 5. Continue this practice for a full 20 minutes, and then slowly, gently and with all your love, bring back your conscious awareness to the room. Notice the peace, tranquility and harmony that you feel having Returned to Eden. Here is a short article explaining the basics of meditation and the reasons for incorporating it as a daily Practice in your life. Everyone can do this! Detailed instructions for various forms of meditation are available in earlier posts - particularly Zazen and Vipassana Meditation. I will gladly assist anyone who is truly interested in establishing this necessary Practice in their life. Just email me from this blog or leave a comment with your question(s). I will respond as soon as possible. My office has been offline for months and will be until Windows 8.1 becomes available and I can get my tower, etc replaced and operating. It may take a few days to reply until then. Patience is truly a Virtue. What Type of Meditation is Best For Me? Aum... Am I meditating yet? "IT" is at the core of every belief since the beginning of man. It is called by countless names but it can not be named. It is outside of the tiny illusion of reality created by the illusory "self" we think we are. It is the Infinite Creative Energy behind All things material and not-material. Christians call it the "Holy Spirit" or God. Neither name nor any others given by different religions or beliefs Is What IT Is. It is "that which can not be named" so I prefer to use the Zen name, "IT". I have experienced "IT" several times in my life. One very powerful and life-changing experience of "IT" is briefly explained in an earlier post below. I included Part II because the two Lessons occurred together, can not be separated, and this life-changing Lesson is the Ultimate Lesson, the Ultimate Goal, the Ultimate Wisdom that one can attain in All martial arts systems - the final Lesson before One can become a True Warrior. The incredible explanation of "IT" by the great 20th Century scholar of Theology, Divinity, and Eastern Philosophy, Alan Watts, came to me as an Agreement, an Acknowledgement of Right Doing, from a sharing of Wisdom about "IT" with a bright young man in town while I was having pizza at my favorite place, Valentino's Pizza, in San Marcos, Texas. I got home later, was uploading some files to the Cloud, and the book by Alan Watts below popped up. I started reading the Introduction and the Table of Contents appeared. My eyes immediately fixated on the title of Chapter 6, "IT". That is called an "Agreement", a sign from my, Our, True Nature or Self, ie; "IT", that my Teaching or sharing was and Is correct. If you pay Attention, you will eventually realize that every question you have is being answered in the most unlikely ways no matter where you are or when or whether in company or "alone". I tell people all of the time that they are Not in Control of Anything and that Everything Is exactly the Way IT is supposed to Be - Perfect! It is when you Think something is wrong and your Ego tries to "fix "IT", someone or some thing gets hurt or worse - like War. With this in mind, I offer this scholarly work below in hopes that you will come to an understanding of what "IT" is All about and learn to Let Go. Enjoy! From Chapter 6 of his book: "On the Taboo Against Knowing Who You Are"
of one and many is therefore referred to in Vedanta philosophy as "nonduality"
explicit differences have implicit unity. obvious than the interdependence of opposites. But who can believe it? sociology can subscribe to this. existence. As the Upanishads say, "That is the Self. That is the real. and need not, go deeper than deep! to all such conceptions, not to IT. abstractions can be more insidious than bronze idols. between oneself and the ultimate reality is no longer relevant. impossible for us to conceive an image higher than the human image. environment, and this must be measured by light-years in the billions. should be just as astonished that we have the brains to perceive it. "given" to us, or an uncanny maze in which we are temporarily trapped. and in its spaces. This is the new image of man, but it is still an image. For there remains—to use dualistic words—"behind," "under,"
itself in the visible contrasts of waves and troughs, solids and spaces. abstraction: it is very simply and truly yourself. happened, which is, of course, the way things were before it did happen. flash of galaxies. It happened. Even if there is no one left to remember. eternal? That is, can a process which had no beginning come to an end? between every pulsation of light. I return in every baby born. times are the same brief instant. we do not trust the universe to repeat what it has already done—to "I"
looking at itself—through our eyes and IT's. plays at being everything else.